There are many ways to deal with events in life. On some occasions it is good to experience all the emotions. On other occasions, however, it is be useful to have a certain detachment. This is especially so when dealing with difficult challenges. 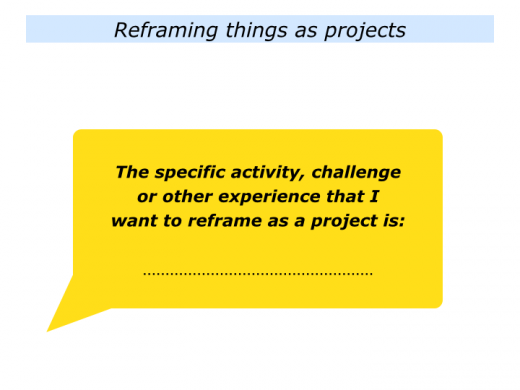 One approach is to reframe things as projects. You can then do your best to achieve success in the particular project. 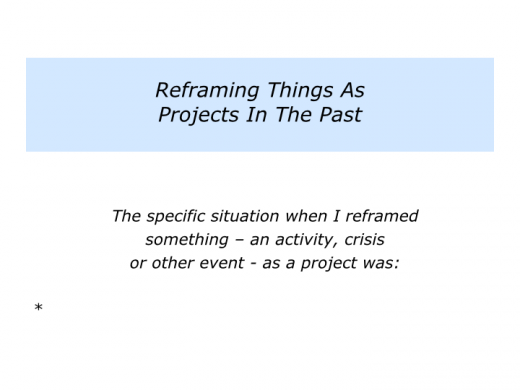 Looking back on your life, can you think of a time when you reframed something as a project? You may have been aiming to find a new job, deal with an illness, tackle a difficult work challenge or whatever. How did you try to retain a sense of detachment, rather than be overcome by the emotions? 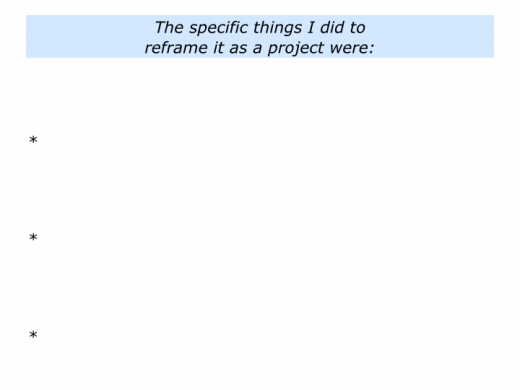 How did you do your best to tackle the project? Looking at my own life, I followed this path when dealing with an illness. Because I had gone for frequent health checks, I was fortunate to get an early diagnosis for prostate cancer. This led to getting non-intrusive pioneering treatment. Being an educator, I could redefine the situation as an opportunity to share knowledge that might help others. Whilst not being qualified to give medical advice, I offered ideas that individual patients could use to navigate their own journey. As a result, people have contacted me and explored various avenues before deciding on their own treatment. Below is a link to the blog I created. To stay calm, refocus on their purpose – in life or work – and see things in perspective. To focus on the positive things happening in their lives – together with their personal and professional assets – to give themselves strength to tackle the project. 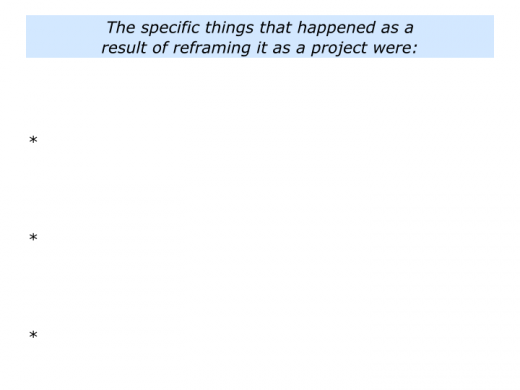 To focus on the project, gather lots of information and clarify what they can control in the situation. To clarify the real results they want to achieve and translate this into a picture of success. 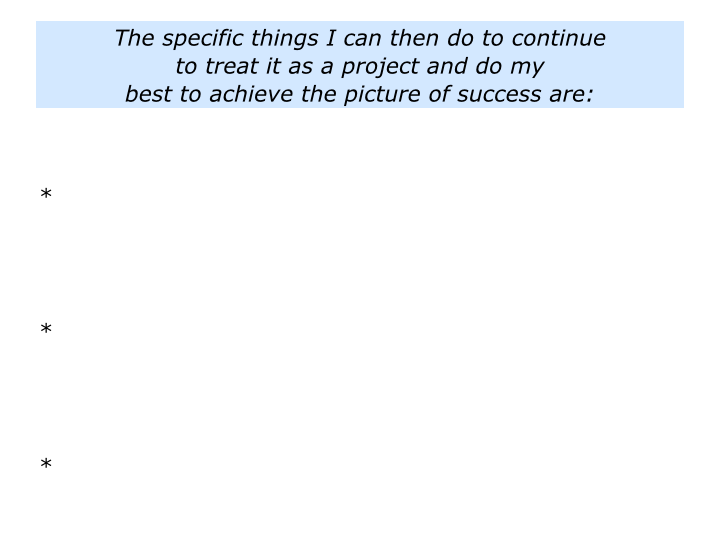 To clarify the strategies they can follow to do their best to achieve their picture of success. To take practical action, create positive momentum and, where possible, get some successes. To encourage themselves and others on the journey, find solutions to challenges and do their best to achieve their chosen picture of success. 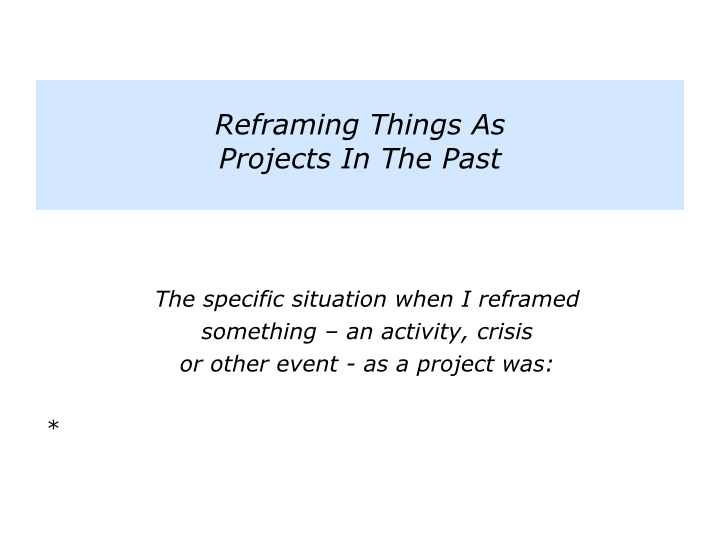 Describe a specific situation – such as an activity, crisis or other event – that you reframed as a project. 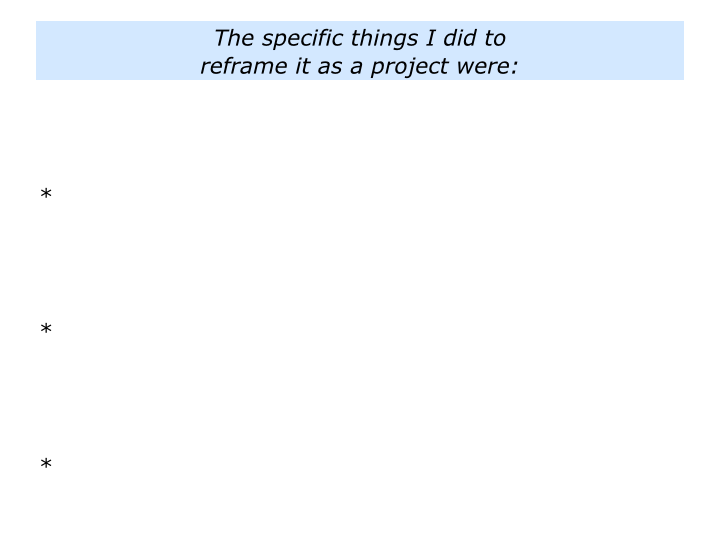 Describe the specific things you did to reframe it as a project. 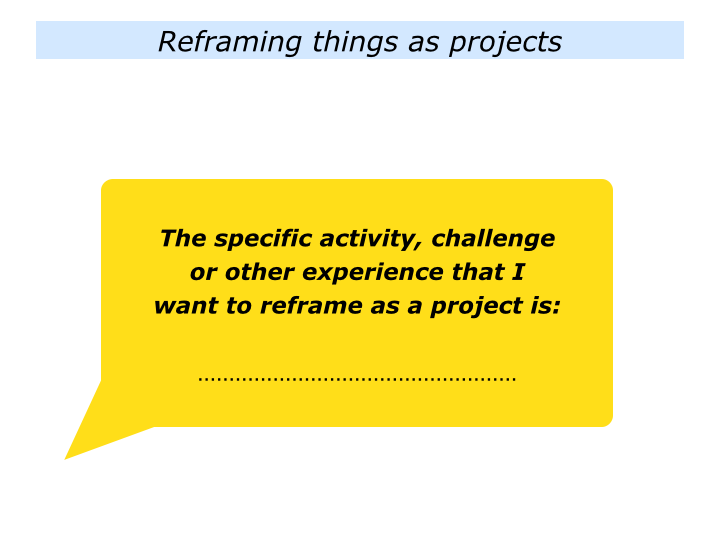 Describe the specific results of reframing is a project. The results may have been, for example, that you were able to focus on the project in hand, manage the emotions and see things in perspective. There may, of course, have been both upsides and downsides as result of reframing. Looking to the future, can you think of any situations that you might wish to reframe as projects? Here are some of the answers people give to this question. Taking care of my health … Taking care of my parents as they get older … Creating a new home when our children leave … Finding a more satisfying job within the next year … Developing ways to feel at peace. Some people see death as a project. They aim to show others how it is possible, within parameters, to die a good death. Some also aim to prepare themselves for dealing with other potential difficulties. In the TED talk below, for example, Alanna Shaikh talked about How I’m Preparing To Get Alzheimer’s. She describes her father and how loving he is. She then outlines her plan to be prepared for the genetically transmitted disease, should it ever arrive. She then explores how she will aim to become a better person. You will have your own approach to dealing with challenging situations. Sometimes it is vital to be open to experiencing the full range of emotions. Sometimes on other occasions it can be helpful to have a sense of detachment. 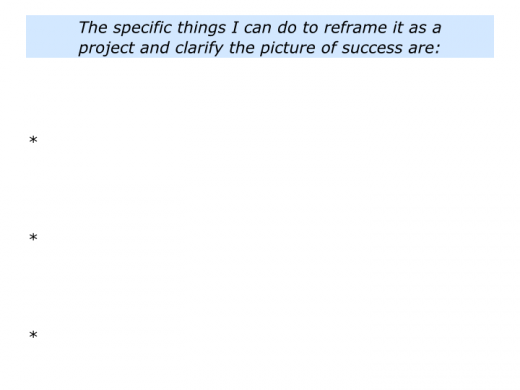 This can help you to settle on and pursue the key strategies for achieving your picture of success. If you wish, however, try tackling the exercise on this theme. This invites you to look ahead and do the following things. 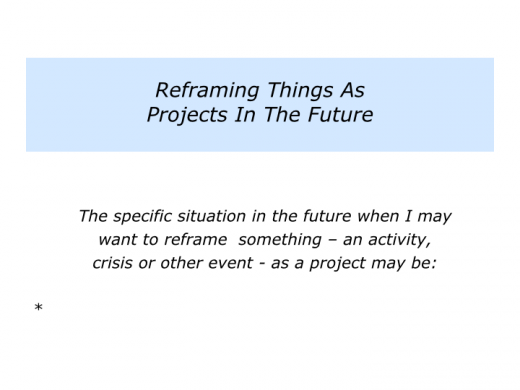 Describe a specific situation in the future that you may want to reframe as a project. 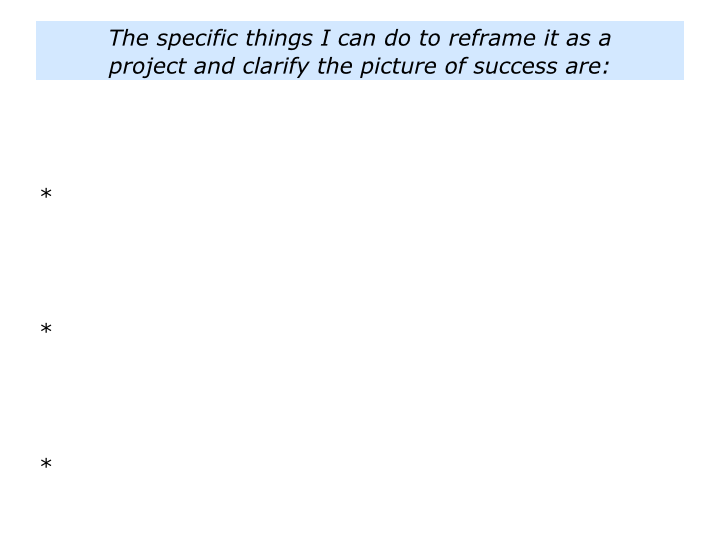 Describe the specific things you can do to reframe it as a project and clarify the picture of success. 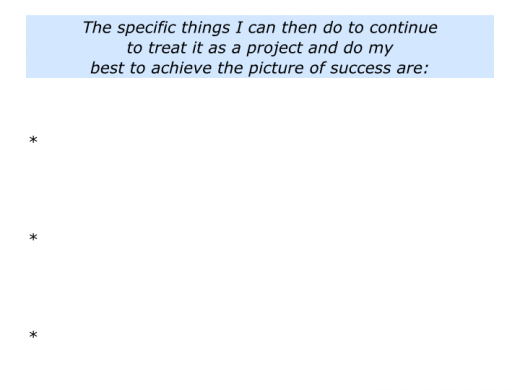 Describe the specific things you can do to continue to treat it as a project and do your best to achieve the picture of success.